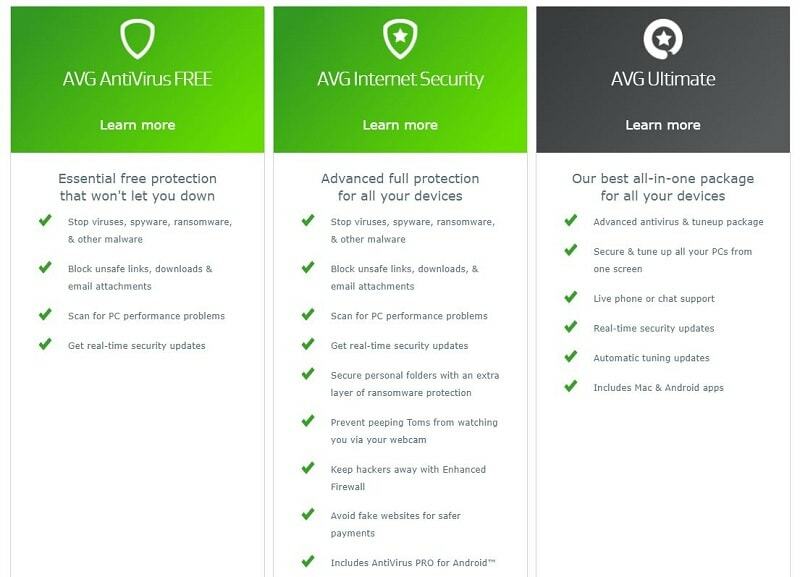 Avast or AVG, which antivirus software is a better choice in 2019? Read this ultimate Avast versus AVG comparison to make a smart decision. Do you know over 800 million new malware samples were surfaced in 2018 alone? In the modern, technology-driven world, you can no longer take your security and privacy for granted. It’s extremely important that you protect all your internet-capable devices from a myriad of ever-evolving digital threats, such as viruses, worms, ransomware, botnets, Trojans. Even if you’re practicing safe online habits, experts say that you can still get infected by malware. It’s better to be safe than sorry! First, let’s see the security products both companies offer for home-based users. If you’re in a rush and want the answer right away, here is a graphic that summarizes the whole comparison. AVG is competitive, but Avast offers a more comprehensive feature-set and better value for money. Independent tests prove that both software provide excellent malware protection with minimal impact on system performance. What is Included in Avast’s Security Suites? Avast’s freeware, popularly known as Avast Free Antivirus, is one of the most feature-rich free antivirus product in the market. Along with providing “essential malware protection,” it offers several handy utilities, such as a WiFi inspector (checks issues and vulnerabilities in your network), a limited Software Updater (tells you about your other outdated applications), an unlimited password vault (available as browser extension), and a Game Mode feature (provides uninterrupted experience). Protection against web- and email-based threats is also incorporated in the freeware. If your computer is so infested with malware that it won’t start, you can make use of Avast’s free Rescue Disk to remove deep-rooted malware. However, you only get limited protection and extra features with the free antivirus products. For a complete peace of mind, you should go with a premium version as they outperform the free ones. 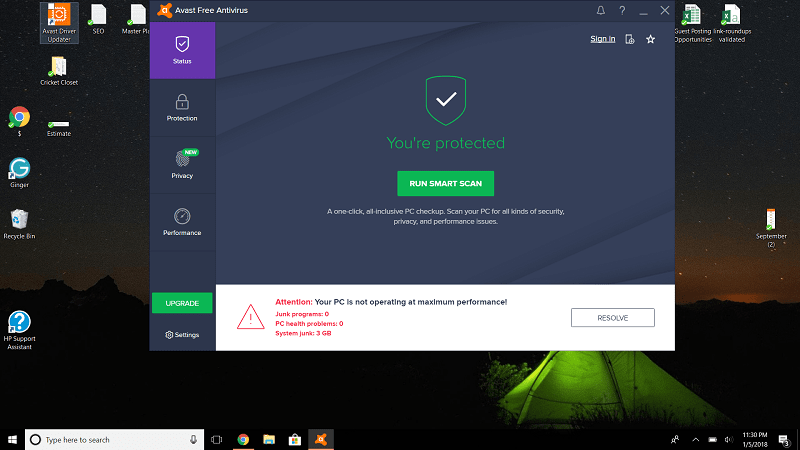 With Avast Pro Antivirus, you get everything in the “free” plan plus Sandbox technology (lets you test suspicious files in a separate environment so they don’t wreak havoc on your computer), a Real Site feature (prevents hackers from redirecting you to fake websites to steal your sensitive details), and premium in-product support. With Avast Internet Security, you get everything that comes as part of the “Pro” plan plus a built-in firewall (monitors network traffic and prevents web-based attacks), and an extra layer of ransomware protection (stops hackers from taking over your personal files), and anti-spam filter (blocks junk emails and phishing scams). Another level up is Avast Premier. It adds a File Shredder, an automatic Software Updater, and also protects against webcam spying. Avast Ultimate is the company’s full-blown suite, including almost every security-related feature and extra utility that you could ask for. Along with everything jammed into the “Premier” suite, it includes a clean-up utility, an unlimited VPN, and a premium version of Avast’s password manager. The two useful browser extensions that Avast offers are Online Security and SafePrice. The latter is price comparison and coupon finder tool that helps you save money while shopping online, while the former blocks dangerous websites and also thwarts phishing attacks. For Mac users, Avast offers two separate security suites: Avast Security and Avast Security Pro. Avast Security is the company’s free offering for Mac users. It includes anti-malware security, a WiFi scanner, and also protects against web- and email-based threats. To get ransomware protection and other additional features, you must upgrade to Avast Security Pro. Now, let’s see what is included in AVG’s premium suites. What is Included in AVG’s Security Suites? AVG AntiVirus Free is the company’s Windows-only freeware. It offers great malware protection but doesn’t offer many extra features and utilities other than a useful File Shredder (thoroughly removes any file or folder). It blocks dangerous websites, links, and attachments and also prevents phishing attacks. Next level up is AVG Internet Security. Along with everything jammed into the “free” plan, it adds dedicated ransomware protection, webcam protection, an enhanced two-way firewall, an encryption utility, and a WiFi Guard (warns you of unsecured networks). A silent mode feature and an anti-spam module (blocks junk emails and scams) are also part of the “Internet Security” suite. Also, a single subscription of AVG Internet Security keeps your whole family secure; you can install it on every device in your household. AVG Ultimate is the company’s top-of-the-line suite. It includes everything that comes as part of the “Internet Security” plan and further adds AVG’s TuneUp utility (fixes performance issues, removes junk, improves battery life, and updates other outdated software). Note: Both AVG Internet Security and AVG Ultimate are compatible with Mac, too. AVG also offers a Mac-only freeware, called AVG AntiVirus for Mac. It includes excellent anti-malware security along with protection against malicious websites and downloads. Avast vs AVG: Which Provides Better Protection? Nearly all the modern antivirus software — including Avast and AVG — use signature-matching technology to detect all the sorts of viruses, spyware, rootkits, and Trojans. In simple terms, they employ different methods to check and compare your files against a huge database of virus definition files, which contain data on known/unknown malware threats and even potentially dangerous files. Any file that matches an existing definition file is either removed or marked as suspicious and is added to cloud servers for examination. AV-Test, Germany’s IT security institute, regularly conducts independent lab tests to thoroughly examine the performance of different antivirus products on different operating systems. Australian independent lab AV-Comparatives also conducts various tests to check and compare the performance of various antivirus products. 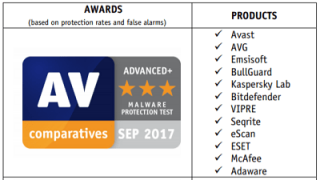 In their Malware Protection Test Report, which published in September 2017, both Avast and AVG received “ADVANCED +” rating with 99.99% protection rate, and returned 9 false alarms (i.e. wrongly identifying clean software as malware). In their Real-World Protection Test which took place in November 2017, both products again received an excellent “ADVANCED +” rating courtesy their 99.6% protection rate. So, it’s a tie in this category as both Avast and AVG provide an excellent level of protection. Now, let’s talk about which software is less resource-hungry. Avast vs AVG: Which Puts Less Impact on System? All modern antivirus products continuously run the background to provide real-time protection against malware threats, and that means they use some percentage of system resources. An application that takes too much of system resources will degrade your computer’s performance. So, it is imperative that not only antivirus software provides comprehensive protection, but also that it doesn’t cause any significant impact on system performance and speed. Both Avast and AVG both are super-lightweight antivirus products and exert a minimal impact on system resources. In September-October 2017, AV-Test conducted a study to measure the influence of Avast and AVG on system speed (system performance) by carrying out typical actions like launching popular websites, downloading and installing, commonly used applications, copying of files, and more. Here’s how much Avast slowed down the system when performing different tasks on a standard and high-end PC, expressed in terms of percentage slowdown. And here the results of performance tests with AVG installed. 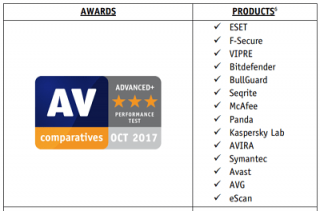 Both Avast and AVG received a rating of 5 stars out of 6, an acceptable performance score. archiving/unarchiving, installing/uninstalling applications, launching applications, downloading files, and browsing websites. Both software received an “ADVANCED +” rating, with an impact score of 8.9. Avast vs AVG: Which Offers a Cleaner Interface? Nobody likes using a piece of software that doesn’t offer clean user experience and easy-to-use navigation. Avast and AVG both will not disappoint you if that is your preference too. Avast’s dark interface sits nicely on Windows/Mac and cannot be resized or run full screen. It has a vertical menu on the left which has four main items: Status, Protection, Privacy, and Performance. Each of those menu items — when clicked — elegantly opens sub-menu items, which contain all its features. There’s also a promotional banner at the bottom for getting you to upgrade to the premium version. At the bottom-left edge, there’s a button which takes you to the settings. On the other hand, AVG’s interface looks a bit overwhelming at first, but when you get used to it, you’ll see it’s very easy to navigate, too. Unlike Avast, there a horizontal menu with the following components: Computer, Web & Email, Hacker Attacks, Privacy, and Payments. If you’re using the free version, you’ll get basic protection, and much of what is on the interface will not be useful to you. There’s a ‘Scan Computer’ button in the middle and next to it, there’s a button which takes to all the different type of scans you can run with AVG. Also, there’s a promotional banner at the bottom. The green color represents that everything is okay and no further action is needed, while the red color signals a problem. Overall, Avast’s interface provides a better user experience and navigation, but AVG’s interface is not far behind. Avast vs AVG: Which Will Cost You More? First, let’s look at the prices of Avast’s security suites. Now, let’s see the pricing of AVG’s suites. Avast vs AVG: Which is More Popular Solution? Avast and AVG belong to the same company and together they capture a huge market share. To determine which among them is more popular is not an easy task. Avast claims to have a user base of 400 million (that includes AVG users, too). AVG, on the other hand, no longer shares its numbers publically. So it becomes difficult to decide which one has a bigger market share based on what we see on their official websites. However, if you look at other sources, you’ll notice that Avast is clearly ahead in this race. According to OPSWAT, a company which regularly releases reports about the market share captured by different antivirus solutions, says – as of 4th Jan 2018 — that Avast is the leading antivirus software with 18.88% market share, followed by ESET (13.88%) and Malwarebytes (11.57%). AVG doesn’t quite make it to OPSWAT’s list of top 10 antivirus products. According to Download.com by CNET, AVG has over 565 million downloads while Avast has been downloaded 411 million times. But Avast’s editor rating’ is 4/5, which means “excellent”, while AVG has 3.5 stars out of 5 (meaning “very good”). Avast also has a better average user rating of 4.5/5 stars as opposed to AVG, which has 4 stars. If you look at social numbers, Avast’s Facebook community totals to 4.1 million while AVG has over 3 million Facebook fans. On Twitter, though, AVG leads the way with 215k followers as opposed to Avast’s 182k. A premium antivirus product is a requirement in the modern world, mainly because your security and privacy are at stake. Both Avast and AVG are reputable antivirus companies that offer several antivirus suites to meet your protection needs. Not sure if I agree with the “overwhelming” comment about the interface. Both look pretty comparable to me. Article seems slanted towards Avast, for whatever reason – even to the point of stretching some of the facts in the data. For example – my AVG premium plan for the $69.99 annual fee, covers all of my PC’s and laptop. I don’t think Avast has a “one fee for all” plan. In addition, AVG provides Private data protection, which Avast does not, according to other rating services. Both Avast and AVG belong to the same company, so it’s out of the equation that this write-up is “slanted towards Avast.” And yes, you’re correct. AVG offers protection for multiple devices with a single subscription. I am going to update it soon btw. Have you had a look at the AVG Tune-Up features bundled with AVG Ultimate? Antivirus plus the Tune-Up add on for $99 per year unlimited devices (PC, Mac, Android). I use Avast Pro now and it is $85 per year for 5 PCs only. Wondering if the Tune-Up add on and having all our devices on the same solution is worth the slight increase over Avast. You’re correct. That seems a good bargain. Having used Avast for 8 or more years I have nothing but good to say about their products. Only reason I’m changing is to cover more devices under the same solution and the addition of the tune-up features. I agree. 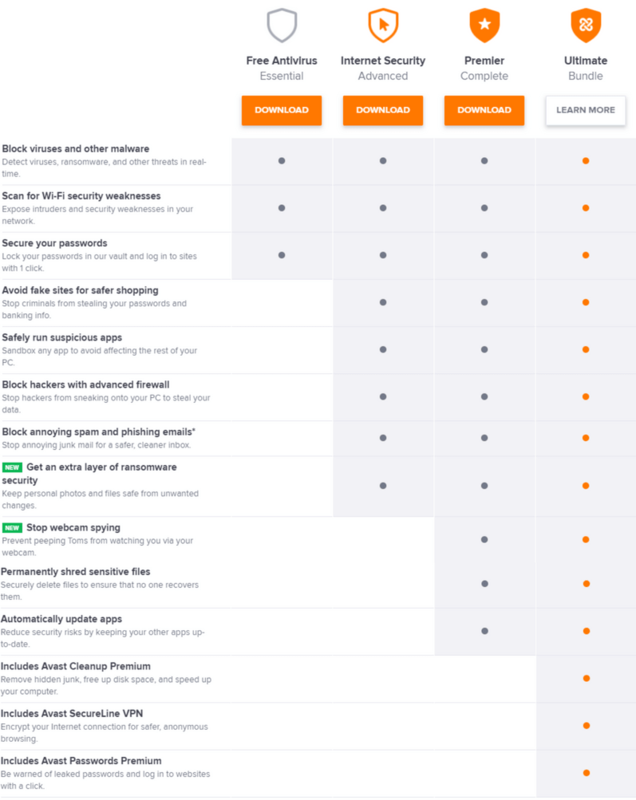 Avast offers some of the best products but you have better (and cheaper) alternatives if you want to protect multiple devices. Av comparatives is an austrian firm and not an australian one. So please correct your mistake in the article. In the graphic summary the “cost” winner is Avira. It is OK when you explain that Avast is cheaper, but it was confusing at the first glance.